How Far Out of Town Should I Live? Many who plan to buy a home in Sequim reflect on how far out of town they should consider buying. Unless you want to be right in the city of Sequim, you are most likely looking at areas within a radius of 7 to 10 miles of Sequim. But how far out is too far? For example, Diamond Point is a 15 to 20 minute drive from Sequim, and Agnew is a 10 minute drive, and Mains Farm (and out by the beach and Three Crabs area) is about 10 minutes from downtown Sequim. 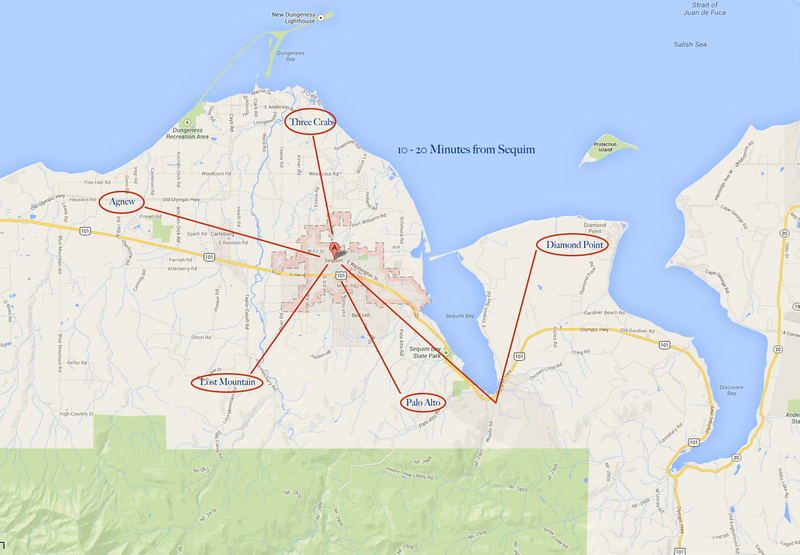 The hills above Sequim up Palo Alto or up Lost Mountain Road can also put you 10 to 15 minutes from downtown Sequim. Is that too far out of town? I’d like to add some perspective on this issue. If you grew up in rural Alaska or Montana, or if you’ve spent a career driving an hour to work every day (Los Angeles, Washington D.C., or Seattle), a 15 minute drive into Sequim will be nothing for you. But for many retirees, the humorous question becomes, “When we run out of milk, who is going to run to Safeway?” Of course, that’s one way of expressing the feeling that a home may be too far out of town. But if you live 15 minutes out of town, what is it really like going to town and how long does it take compared to living only 5 minutes from Safeway? Since Sequim doesn’t have traffic congestion or rush hour slow downs, you don’t have the same concerns you would if you lived in a metropolitan area. One of my clients lives five minutes from Safeway. When they go to town and make two stops, one at Safeway and one at Home Depot (or Petco), it takes them about one hour from the time they leave their home to the time they return, if they don’t dillydally too much. I also have some clients who purchased a home in Diamond Point, and when they go to town for the same two visits, or similar two stops, it takes them about one hour and twenty minutes from the time they leave their home to the time they return. My point here is that the greatest amount of time spent by both homeowners is not the time on the road getting to Sequim–it’s the time they spend driving through traffic downtown Sequim and walking around the stores. For the couple living 10 minutes further out of town, they say they love living further out. For them the drive is the easy part. But everyone has to drive through downtown traffic, stopping at lights and inching one’s way through the parking lots. That’s what takes more time. But if you love to run to Safeway or somewhere else in Sequim every day, then travel would be more of an issue. Most retirees don’t do that. Most plan their shopping at Costco and Safeway ahead of time, and if they go shopping twice a week in Sequim, that’s enough. In that case, living 15 minutes out of town has it’s advantages if you like privacy and some of the other benefits of living further out of town. Why Are People Leaving California? How Shall I Live The Rest of My Life?